Planning a break cycling in the Dordogne? At Cycle Breaks, we offer cycling holidays in France and Western Europe, ranging from 5 to 7 nights that are self-guided and fully supported. We offer a great variety of inspiring holiday destinations and ensure that a high level of personal service is always at the top of our agenda. We select places to stay ourselves, looking at them from a cyclist’s perspective and ensure that there are plenty of places to savour real local flavours along our well-researched routes. 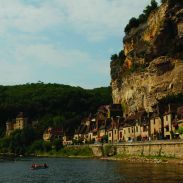 Our Dordogne bike tours include the chance to explore the awe-inspiring history and scenery of this stunning area of France; the region east of Bordeaux famed for its fine wines and foie gras, prehistoric cave paintings and precariously positioned villages and cliff-top châteaux. 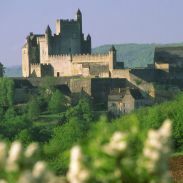 We also offer cycling holidays in other parts of France including Provence and the Loire Valley. Cycling Holidays in France – click here to browse our French cycling holidays. Cycling Tours Dordogne – click here to browse our Dordogne bike tours. Whether travelling by plane, train or ferry from the UK or heading by car or rail across the Continent, France, the land of baguettes, berets and so very much more, is very approachable from all directions. Good hospitality, an array of rich history, a mild climate and relaxed pace of life, delicious delicacies, the finest wines, plus breath-taking scenery from rugged riverscapes to laid back flood plains make it a refreshing choice for a gentle cycling adventure. Cycle Breaks itineraries are designed to share all the local flavours – a formula which is so very fitting for the Dordogne. From red wines as robust as the bastides which you pedal past, to the smoothest creamy foie gras or treat of a truffle sauce, the Dordogne is a really rich experience all round. And what better way to earn that rewarding supper than a day on two wheels winding through history along the river which has carved such amazing landscapes through time? Cycle gently along flat riverside lanes, or climb higher to picnic above the roof-tops. Choose your own pace, follow the occasional suggested detour if you wish. Cycle Breaks routes give plenty of top tips and options along the way, guiding you through the Dordogne’s forests, over rolling hills and up to breathe in the most awesome panoramas at places like Rocamadour. The terrain is more challenging than the slopes of the lazy Loire, but every effort is richly rewarded – not just at supper time! Sit a while in the sun on Sarlat’s medieval square. Head for the shade of the caves near Les Eyzies. Or watch the eagles soar over the Alzou Gorge as the light fades and evening cools a little. The Dordogne has its own special climate, warm yet refreshing at times, well suited to cyclists generating their own gentle breeze as they head off on their own new adventures. Near Souillac on the Dordogne, the Grottes de Lacave lead deep into another world; at Lascaux near the Vezère river, the finest cave paintings were discovered including the famous Grand Taureau (Bull). All is explained at the interpretation centres near Les Eyzies in the Vezère Valley which justly wins the title of prehistoric centre of France. A medieval masterpiece lies waiting to be discovered around almost every meander: there’s a fortress château at Beynac, an abbey at Buisson-le-Cadouin and great gardens at the Château de Marquessac. The best view of historic La Roque Gageac has to be from an wide open boat or Gabare on the Dordogne itself. As the name suggests, the village cowers against the most imposing cliffs, the stone houses almost blending into the rockface along the historic quayside. Elsewhere, Sarlat-la-Canéda’s medieval streets and squares have been bustling with market day activities simply for centuries. And up on the hillside, Rocamadour, a place of pilgrimage since the 12th century, perches precariously on a rocky outcrop, but who can say whether this or Domme on the banks of the Dordogne with its royal bastide deserves the title of the most beautiful place in France? We simply love France and cycling too – and sharing our enthusiasm and expertise. We develop routes and select accommodation to ensure the most inspiring and refreshing of gentle cycling adventures. The detail in our tours is appreciated by our customers and our holidays are considered to be good value for money. We have developed our French programme slowly, choosing tours carefully. We visit the hotels personally, refining selections and preparing our own detailed route notes from our own research. We can advise on the suitability of routes, how to get to your chosen start destination and tailor itineraries to individual requirements. What’s more, we aim to offer real peace of mind, organising accommodation, arranging luggage transfers and en-route support and preparing meticulous route notes and mapping with top tips all round, so you can relax on your gentle journey as you travel through time along the Dordogne and its tributaries.